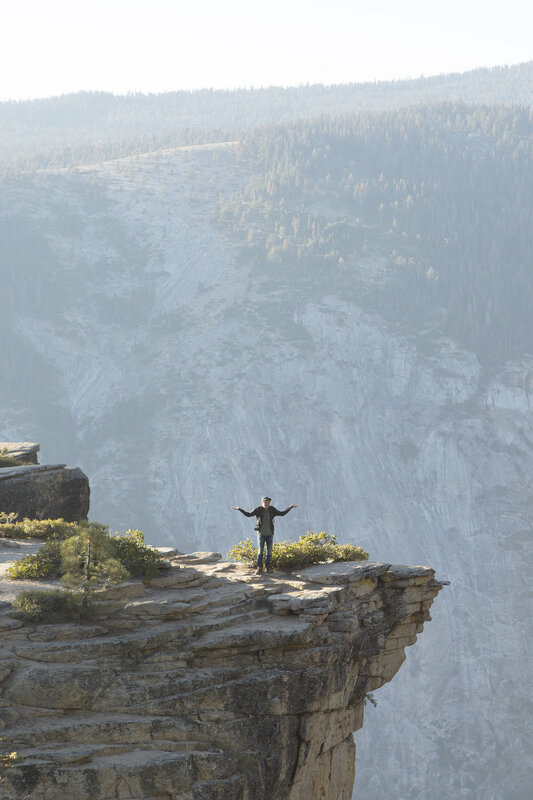 Minus the tourists, Yosemite is a phenomenal National Park worthy of visiting at any chance. It's massive, beautiful, scary and serene all at once. Our first time visiting was in Summer of 2014 during my first tour out west, and we returned in September 2016 more efficiently with the RV. From the valley up to Taft Point and over to the Travertine Hot Springs just outside the park perimeter, Yosemite is a gem of our country. Taft Point pictured above was the spot for sunset. It's an easy 2.2mi roundtrip hike, but a bit frightening once the trail drops off a 1000ft cliff into Yosemite Valley. This viewpoint is a bird's-eye view of the park as a whole. We climbed up the highest balanced rock and watched the sun drop behind the mountains. The sky quickly turned navy blue bringing all the stars out an hour later. To capture some decent nighttime photos, we boondocked at the trailhead after making dinner. We were especially surprised rangers didn't come knocking to kick us out. That night after Taft Point sunset, we passed back down through Tunnel View for a lunch looking out into a postcard. The photo posted below is from the acclaimed Tunnel View parking lot, but please note that right behind me were about 4 charter buses and over 500 other tourists. Sometimes it's a good idea to not pay too close attention to your immediate surroundings in situations like this. I chose to pretend I was visiting during the John Muir days. We revisited the valley and gallery of Ansel Adams Yosemite days and kept moving. If you're into adventure reading or just admire the amazing John Muir, I'd highly suggest picking up The Wild Muir for short stories on his life. Making our exit through the meadows, we boondocked once more on Tioga Road and treated ourselves to a hot RV shower. This time a ranger honked at us, but didn't bother to stop. We were on our way. Heading east out of the park, we stopped at Travertine Hot Springs which turned out to be in a great setting for a natural relaxing mineral soak with the mountains in the distance. Beware of snakes and if you're planning a visit please keep in mind the leave no trace policy. A short drive away is Mono Lake where the tufas will actually blow your mind and question their existence.